Freshen up your holiday fare with a light and refreshing Virgin Herbal Sangria! I love herbal teas! I am constantly brewing teas for my family- iced or hot with honey and milk–hydrating, rich in antioxidants, boosts the immune system — prevention for flu season! 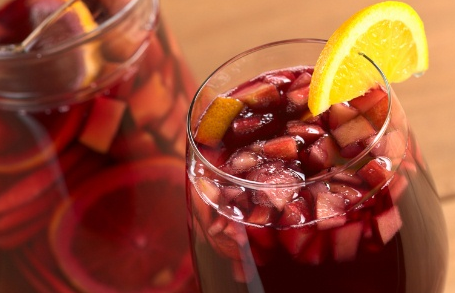 Traditionally, Sangria is a fruit-based wine punch, typical of Spain, Portugal, Mexico and Argentina. There are many variations… usually consisting of wine, chopped or sliced fruit, a sweetener (such as honey, sugar, simple syrup, or fruit juice) and a small amount of brandy and orange liqueur. This Sangria is herbal based… and non alcoholic….so it can be enjoyed by everyone! Most food markets carry a vast selection of teas. Choose one with Hibiscus flower… that’s what gives the drink the rich crimson color. My first choice is anything organic– I like Celestial Seasonings- Wild Berry Zinger or The Republic of Tea- HIBISCUS Superflower Tea. As for the fruit I like to use oranges, lemons, limes and apples- I always buy organic apples because they are on the EWG’s Dirty Dozen List. Enjoy ! Have a Merry Christmas and a Healthy ( well hydrated ) New Year! Pour 2 cups boiling water over four tea bags in a heat-resistant container. Steep 4-6 minutes and remove tea bags. Squeeze the juice of 2 oranges, 1 lime, 1 lemon, into the tea and honey mixture. Slice the remaining orange, lime and lemon into thin slices, and chop the apple into small cubes. Add all the fruit to the liquid.